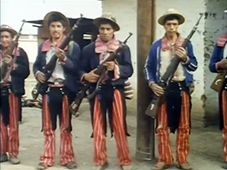 Following the award-winning TODOS SANTOS CUCHUMATAN and TODOS SANTOS: THE SURVIVORS, MAYAN VOICES: AMERICAN LIVES explores the everyday life of a community of indigenous Mayan indians who fled Guatemala's political violence in 1981 and settled in the United States. Set in Indiantown, Florida, a small agricultural town near West Palm Beach, and Provincetown, Massachussets, the film contrasts the experiences of families who came as refugees ten years earlier, with the struggles of those continuing to arrive in search of better lives. It demonstrates the impact 5,000 new immigrants with a foreign language and culture is having on the still predominantly white community. MAYAN VOICES: AMERICAN LIVES explores issues of identity, cultural integration, migration, and social change. Interviews with Mayan high school students, a teen mother, community leaders and migrant workers reveal the horrors which forced them to flee their country and negative emotions which have deep roots in the oppression that has marked Guatemalan history. As newspaper headlines, photos, and titles underscore these issues, MAYAN VOICES: AMERICAN LIVES breaks through refugee/migrant worker stereotypes and looks deep into the human spirit as it confronts an ever-changing world, while giving voice to an historically silent people. 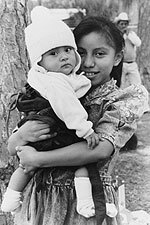 "A wonderful look from within the lives of Mayan and other Guatemalan teenagers, young parents, and older immigrants now living in the U.S."—Allan F. Burns, Professor of Anthropology, University of Florida, Author: MAYA IN EXILE. Now on one DVD, Olivia Carrescia's three films on the Mayan Indians of Guatemala preserve a record, and provide an acute observation on how the indigenous culture has been affected by, yet survived, that country's tumultuous history. Welcome to a unique Parisian program for immigrant children from all over the world. The Guatemalan Forensic Anthropology Foundation exhumes up to 1,000 bodies a year to identify them, and return the remains to their families. Returning to Todos Santos after 30 years, a look at the profound economic and social changes that have transformed this Guatemalan Mayan village.